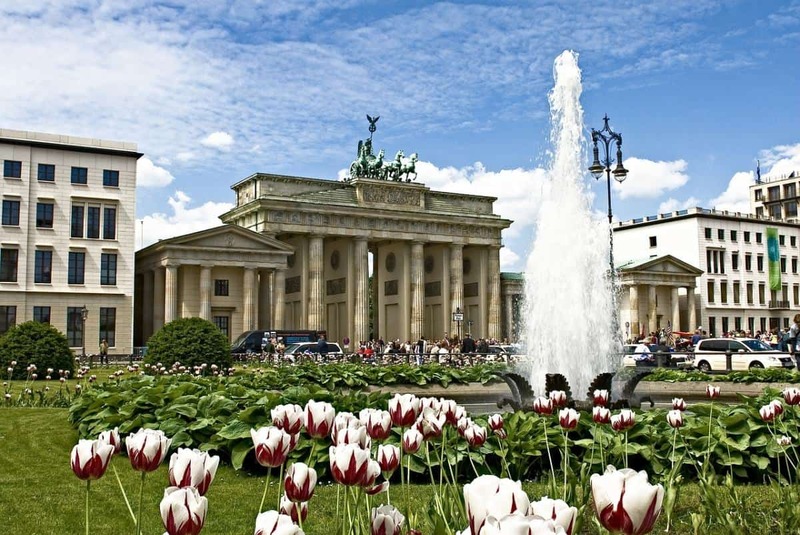 Compared to other West European capitals, Berlin still remains a relatively cheap destination. Of course, you can easily spend a lot of money while there. But there are also a lot of free attractions in Berlin that you can visit. In this post I will try to explain to you what to do in Berlin when you are on a budget. As a local travel blogger, I am always on the lookout for exciting and new Berlin attractions that are free to visit. So, in this list you will find not just free things to do in Berlin but also some off-the-beaten-path ideas. After brainstorming for this guide I came up with a total of 100 free attractions! To make it easier for you, the list is split into themes: A) Free museums and attractions that are indoors (perfect for rainy, cold and windy days), B) free outdoor things to do, C) my most favourite parks and playgrounds (great for families and hot days), D) interesting self-guided walking tours, E) exciting street art hotspots, and F) the best lakes for summer. Lastly, I also added some cool money-saving tips for your next trip to Berlin – how to eat and drink cheaply, get around, and save money when visiting the major sights. 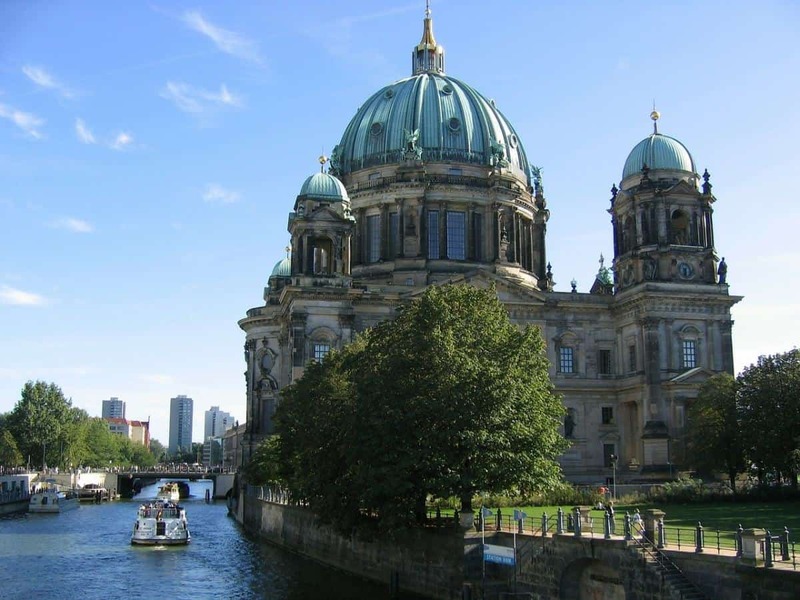 Berlin has a wide variety of museums, some of them are even UNESCO world heritage listed. 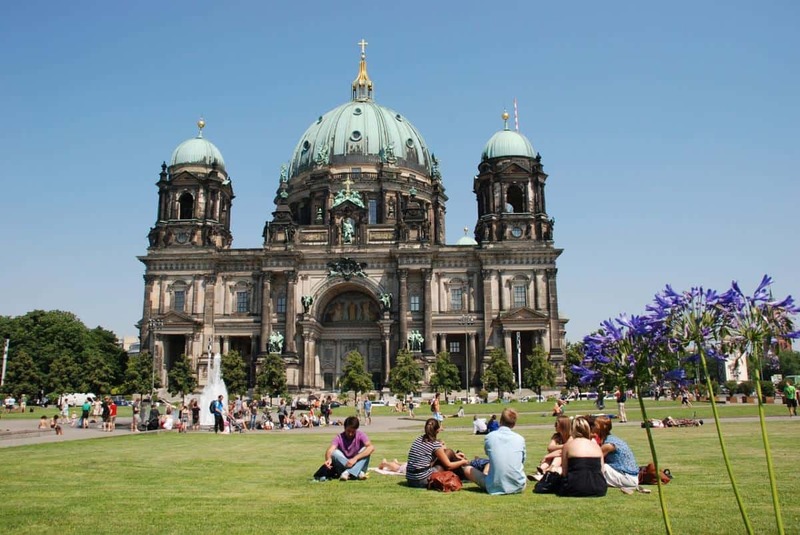 Unfortunately, those museums that are well known, in particular the Museum Island museums, are not free to visit. Rarely will you find a day where they will open to the public for free. However, there are many more museums in Berlin that are indeed free. I have included these museums in this list, together with many other free indoor attractions. 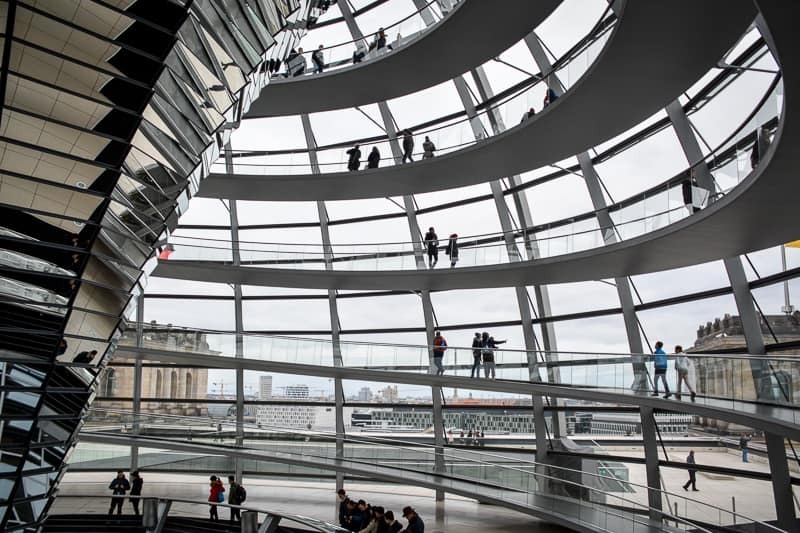 The Reichstag Dome is one of the many free attractions you can visit in Berlin. Brandenburg Gate is always free to visit and an iconic symbol of German history. Truth be told, the weather is not always nice in Berlin. In fact, the city can be horribly cold and the weather totally miserable. But thankfully it is not always like this. When you travel to Berlin some time between April and Oktober, chances are that you will have nice warm days with no rain or nasty winds. The closer you get to summer, the better, of course. This is the perfect time to explore some of Berlin’s amazing outdoor attractions such as interesting buildings, open-air memorials, gardens and markets. This list starts with the obvious and will end with some ideas off-the-beaten path. Read here which outdoor ideas I recommend! 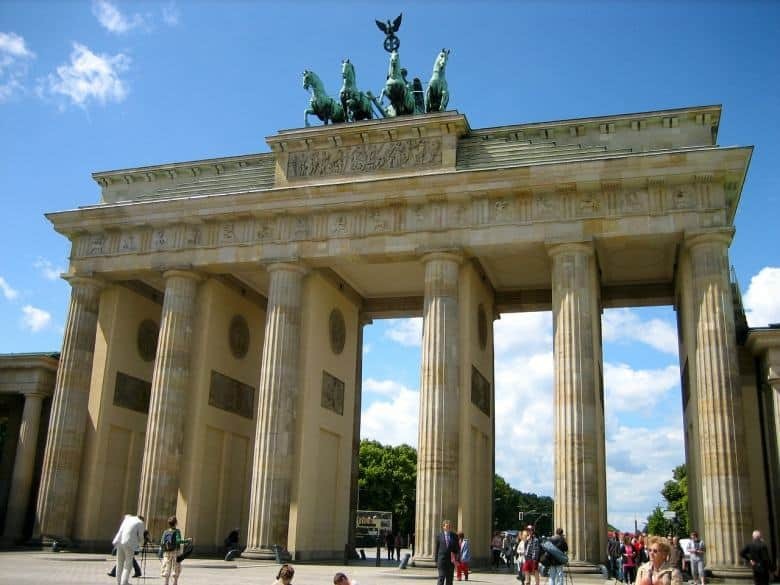 Berlin’s most iconic landmark, Brandenburg Gate, is a must-see for any visitor to the city. It is a symbol for a Germany divided and reunited, the place where history was made and the first East German citizens were able to cross the German-German border into the West. If you want to take pictures without tourists, come early in the day because this place can get pretty busy! 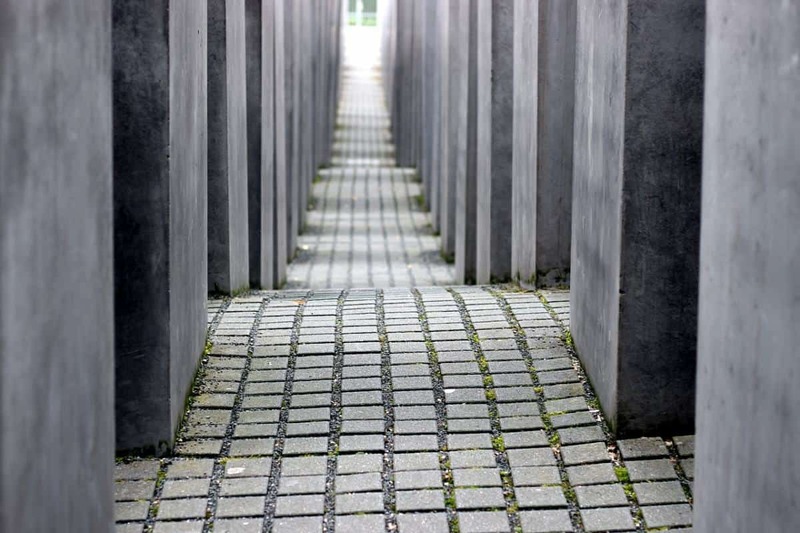 The Holocaust Memorial is a free attraction which commemorates the murder of millions of European Jews. 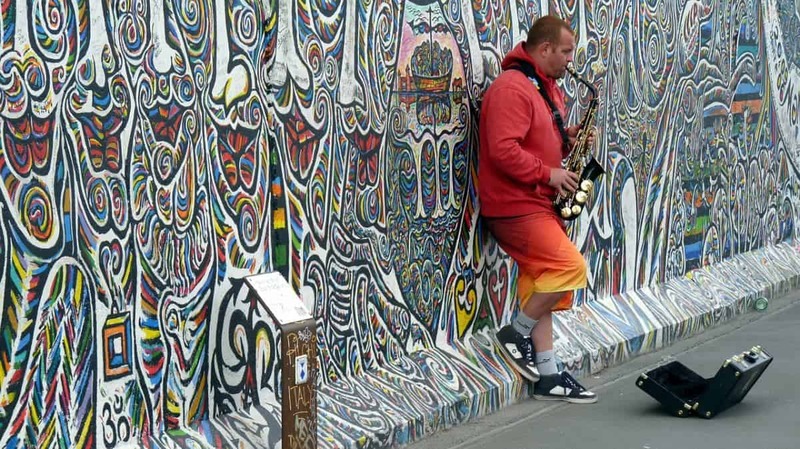 East Side Gallery is a long remaining stretch of the Berlin Wall that has been transformed by local and international artists into an open-air gallery. Lustgarten is a small park right in the middle of the historic centre. Alexanderplatz is the former central square of East Berlin and still one of the most prominent parts of the city. It is home to a number of important sights such as the TV tower, the World Time Clock and the Red City Hall. You will also find plenty of shopping, movie theatres and restaurants here. Additionally, Alexanderplatz is an important transport hub. Other than that, I think you can give this square a miss – it is a hot spot for petty crime and generally lacks aesthetics and appeal. The unused land along the German-German border, aka the Berlin Wall, was a heaven for some creatures who disappeared as soon as the Wall came down. I am talking of rabbits, of course. An artist has come up with memorial stones that are set in the pavement to commemorate the fluffy beasts. You will see them easily north of U Schwarzkopffstr. on Chauseestr. in Mitte. Truth be told, Potsdamer Platz is not my favourite place in Berlin as it’s really loud, touristy and overpriced. But you cannot deny that there is a lot of history here and that you can see some of the most exciting contemporary German architecture. Highlights of the area include a visit to the Mall of Berlin, the Sony Centre, and Potsdamer Platz Arkaden. Gendarmenmarkt is a romantic square with beautiful old buildings such as the French Cathedral, the German Dom, and the Concert House. It is particularly pretty around Christmas time when there’s the Christmas market and an ice-rink to add an additional layer of magic to the experience. It is easy to overlook Bebelplatz in the historic centre of Berlin as it fits in smoothly with the overall look of the area. However, do not walk past but investigate further. In the centre of the square you will find an underground memorial with rows of empty bookcases – a memorial to the book burning during the Nazi regime. With its angels, tombs and mature trees, Dorotheenstädtisch-Friedrichswerderscher Friedhof is one my most favourite cemeteries in Berlin. A number of famous people from the last two centuries lay buried here. Some of them are of international fame, for example poet Heinrich Mann, philosopher Hegel and architect Schinkel. Berlin is not just home to some really good flea markets. Wait with your visit until December, and you get to enjoy the many wonderful Christmas Markets around town. My most favourite ones can be found on Gendarmenmarkt, at Kaiser Wilhelm Memorial Church, at Charlottenburg Palace and at Kulturbrauerei in Prenzlauer Berg. More info here. It is a little known fact except for those in the inner circle that David Bowie once lived in Berlin for a number of years. Not only that: He also shared the apartment with Iggy Pop. The address is Hauptstr. 15 in Schöneberg. It is an ordinary apartment house, so not a museum and you won’t be able to go inside. However, if you want to learn more about Bowie’s time in Berlin, read this interesting article on Fotostrasse blog. Maybe you’ve been to Hollywood Boulevard to see the stars there? Berlin has its very own version, and of course it comes with a German twist. All stars featured are tied to the German movie and entertainment world. But of course there are also some well-known international names such as Wim Wenders, Diane Kruger and Armin Mueller-Stahl. You will find the Boulevard of Stars at Potsdamer Platz just next to Sony Centre. Granted, entry to the Jewish Museum is not free (it is around 8 EUR per person). But – you can admire the fantastic architecture from the outside. The museum was designed by world-renown architect Daniel Libeskind who also worked on the World Trade Center master plan and the National Holocaust Memorial in Ottawa. The focus of the museum is on an artistic interpretation of the Jewish fate during the Nazi regime rather than recounting the facts. The buildings fit right in with that and the garden surrounding it (with lots of installations) is free to visit. The art market on Museum Island near Zeughaus is one my favourite free places to visit in Berlin on a weekend. This market right by the water offers the very latest in Berlin arts and craft including fashion, jewellery, photography and paintings. It is open every Saturday and Sunday. Stolpersteine can be found all around the city. They commemorate Jewish citizens who lived at these addresses and their fate during the Nazi regime. 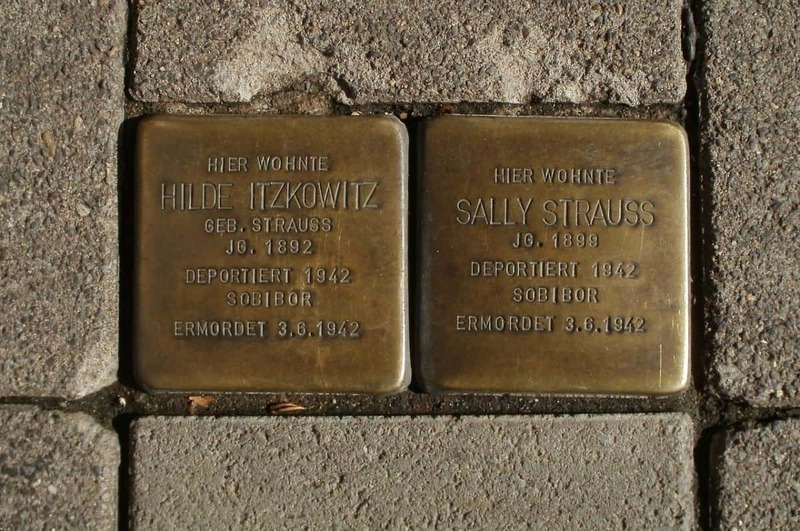 Stolpersteine literally means “Tumbling Stones”. They are slightly elevated cobblestones set in the pavement. Pay attention as you are walking around Berlin and you will notice them in several places. The cobbles are there to remind us of the Berlin citizens who were deported and murdered during the Nazi regime. The names on the stones correlate with the place – these people used to live in the houses right in front of you. Street musicians can be found at selected spots all around town (they need to have a license to perform). Keep an eye out for them at Oberbaumbrücke, Mauerpark, Kaiser Wilhelm Memorial Church, Maybachufer, and Alexanderplatz. There are also some subway stations with legal street musicians, for example Schlesisches Tor, Yorkstrasse, Hallesches Tor and Wedding. 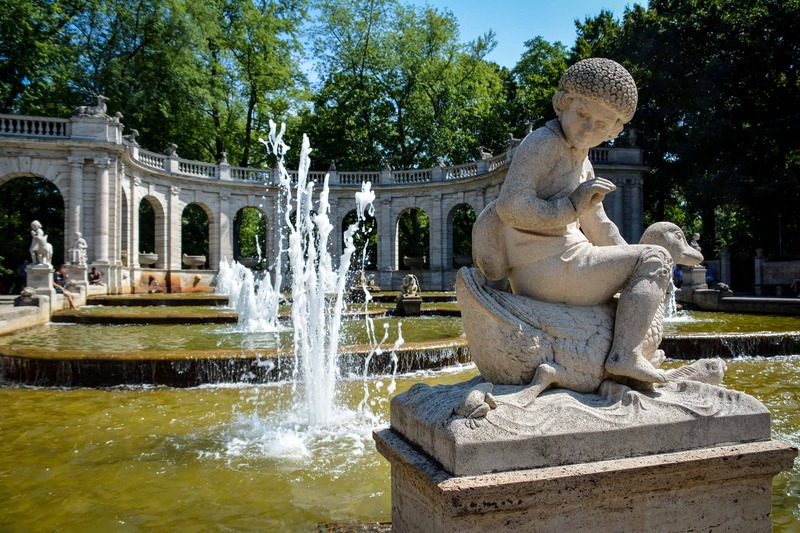 The Fairytale Fountain in Volkspark Friedrichshain is one of the highlights of this big park in the city’s east. Despite its urban flair, Berlin is a green city. Lakes and forests offer lots of day trip opportunities. There are the River Spree and Landwehrkanal cutting through the urban landscape like blue ribbons. Small leafy squares and playgrounds add welcome places of relaxation and respite. See in this list which parks are particularly beautiful and easy to reach! Tiergarten is the big park in the centre of Berlin. I always like to compare it to Hyde Park in London or Central Park in New York. It is big enough to let you forget that you are in the middle of a big city. Highlights of Tiergarten include the New Lake, the Victory Column, the Rose Garden, the Soviet War Memorial, and the Carillon Bell Tower. Volkspark Friedrichshain was the first park in Berlin that was built specifically for the public. It’s a popular meeting place in summer as it offers a mix of lawns, wooded areas, lakes and playgrounds. Highlights include the flak tower hill (with covered up remains of the destroyed flak tower from WWII), the gorgeous Fairytale Fountain and the toboggan run in winter. While entry to Charlottenburg Palace is not free, the adjoining park and gardens are open to the public. I love to come here to enjoy the flowering beds and lush green of the lawns. Set right next to the River Spree, there are quite a few ponds and lakes, as well as a number of historic buildings such as the Belvedere and the Mausoleum. Tempelhofer Feld in Tempelhof-Schöneberg is the site of the former Berlin Airport. It’s a perfect green space to ride your bike, run with a kite or have a picnic with friends. The site is historic and iconic, and there are several guided tours in the main building (which are not free, unfortunately). Treptower Park is a pretty river-side park in Berlin’s east with an oversized Soviet War Memorial, a carp pond and a planetarium. Just south in Plänterpark, there is a notorious derelict theme park called Spreepark. You can only visit Spreepark via a guided tour at this stage, but Treptower Park next door is free and a destination in itself. One thing people who visit Viktoriapark in Berlin rave about most after their visit is the pretty waterfall. But also the Prussian Monument for the Liberation Wars is worth a second glance. Great views from top of the peak! The former railway site at Gleisdreieck has been transformed into a huge green space over the years that is today a favourite with locals. It is perfect for biking but you can also grab an ice-cream and stroll the quiet grounds or watch the kids in the skate park. Just like Volkspark Friedrichshain, Volkspark Humboldthain offers a mix of wooded areas, flak tower hills and playgrounds. In the north, there is a pretty rose garden. The outdoor pool is not free but might be a lifesaver if you are visiting on a hot summer’s day and you are looking for refreshment. A walk along the broad Berlin boulevards or on the banks of a canal can be among the most relaxing things to do in Berlin. The city has some very charming areas which are best explored by foot. These self-guided walking tours will help you discover a very different side of the city. Start your walk at Brandeburg Gate. If you have the time to spare, you may want to visit the Reichstag in the north or the Holocaust Memorial in the south before you set off. Then, just follow the broad boulevard straight to the east. The street is called Unter den Linden. On your way, you will come past the following sights (in that order): Brandenburg Gate, American Embassy, Pariser Platz, Hotel Adlon, Russian Embassy, French Palais, Microsoft Store, State Library, Humboldt University, Bebelplatz, Opera House, Neue Wache, Kronprinzenpalais, Humboldtforum, Zeughaus, Lustgarten, Berlin Cathedral, DDR Museum, TV Tower, Alexanderplatz. Total walking distance 2.5km, 30 mins. This walk will take you along the canal that cuts through trendy Kreuzberg. 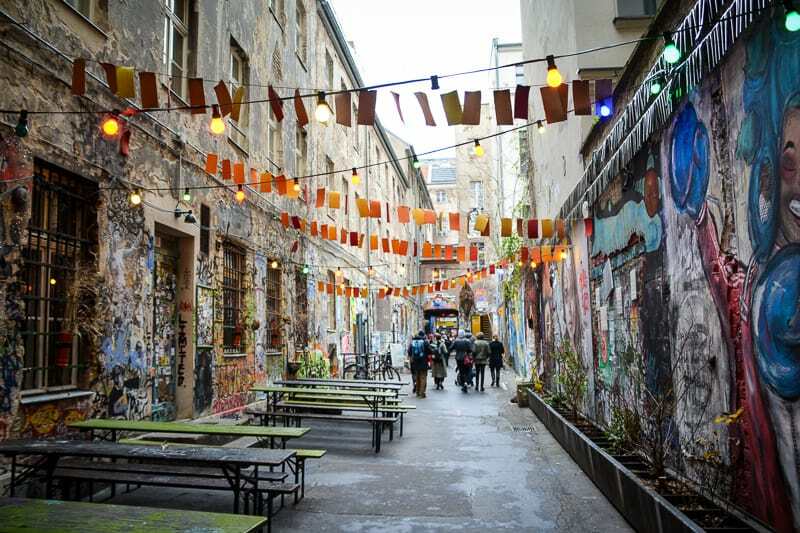 You will see a mix of green spaces, alternative ways of living, cool shops and an international flair – everything that Kreuzberg stands for.You may want to start at Schlesisches Tor and find your way through Görlitzer Park to Landwehrkanal. Beware that this park is Berlin’s drug trafficking hotspot. Walk across the bridge to get to the southern side of the canal, then head right towards Lohmühlenplatz. You may see some alternative living concepts on your way, groups of people living a life of freedom in trailers. Cross the canal again to get to the western side at Lohmühlenplatz and turn right again. Take the next bridge to reach Paul-Link-Ufer and follow the canal until you reach the next bridge. Do not cross but turn around, follow the canal all the way until you get back to Schlesische Strasse. Here, you will find Lohmühleninsel which you crossed earlier with your first bridge. The area is packed with sights and attractions as well as parks and playgrounds. Have a look around before you finish your walk in one of the many cafes and restaurants. Total walking distance 6.2km, 70 mins. Many first-time visitors to Berlin are surprised to find that very little remains of the Berlin Wall today. In the city centre, all you will see is a line of cobblestones that cuts through streets and follows sidewalks. East Side Gallery is probably the longest stretch of Wall that is still standing, although now as a curated street art gallery. Near Nordbahnhof, you can experience the brutal enforcement of segregation at the Wall Memorial. To follow the entire length of the Berlin Wall, however, check out this site which shows a map with detailed information on how to circumvent West Berlin following the Berlin Wall Trail. Bergmannkiez is a little oasis in the crazy and hectic inner city world of Kreuzberg. Locals in this suburb hail from all corners of the world, and they all enjoy the cosy and peaceful atmosphere of this kiez. The houses were thankfully not destroyed in WWII and offer their very own charm, sprinkled with historic courtyards, gas lanterns, street markets, cafes and cemeteries. Check out this self-guided walk of Bergmannkiez that is offered by the Berlin Tourism site. Looking for more ideas for walks around Berlin or maybe want to join a guided tour? 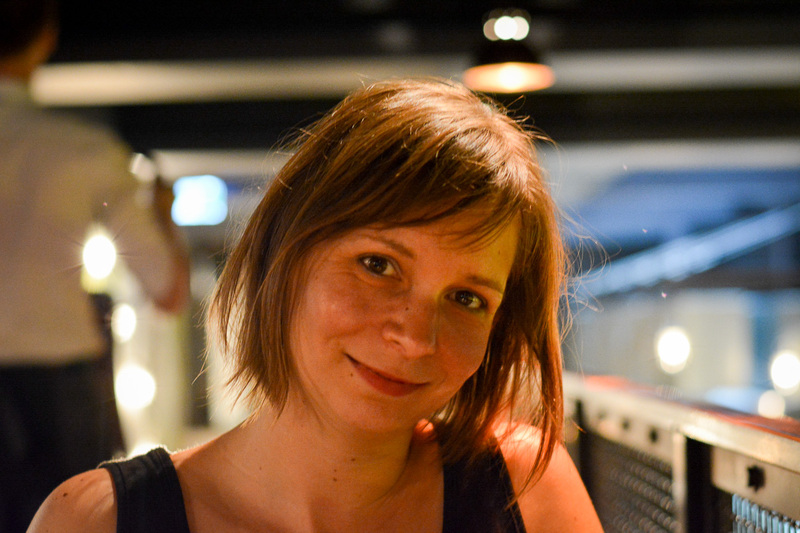 The team behind Alternative Berlin offers daily free walking tours. More info here. Berlin is famous for its exciting street art. 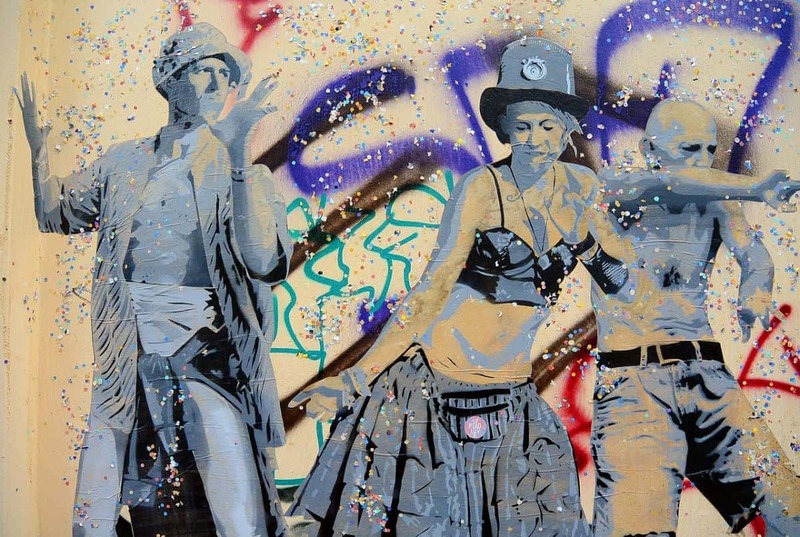 Kreuzberg is a great place to start if you are on the lookout for the latest works of renown artists. Street art is part of Berlin just like currywurst and tourist bashing. If you want to know what the latest trends in the art world are, you cannot close your eyes from the innovative, provocative and oftentimes funny urban artwork that celebrate the city. There is no real hotspot for street art in Berlin but if you have a look at the inner suburbs and neighbourhoods such as Kreuzberg, Friedrichshain and Hackescher Markt you may get lucky. Here are my top spots for street art in Berlin. The subway does not always run underground in Berlin. Both U1 and U3 run as a high line for a couple of kilometres connecting the East of the city with the West. Along the line, take the opportunity to look out the windows and you will see some amazing street art along the way. In particular around Nollendorfplatz because this is where you will find Urban Nation, the street art museum. Street art is a big thing in Berlin. There are a couple of hotspots you can explore like this one at Hackescher Markt. One of my most favourite street art hot spots in Berlin can be found at Hackescher Markt in a courtyard right next to Hackesche Höfe. You will find it when you head to Anne-Frank-Zentrum. If you walk all the way to the end you will arrive at Haus Schwarzenberg which is home to a number of art galleries and other businesses. Have a look inside, you won’t regret it! For some awesome oversized murals on tall apartment blocks in Berlin’s outer suburbs, take a train to Tegel. The colourful murals can be found close together around Neheimer Str. and Bernauer Str. and are stunning due to their immense size. Friedrichshain has a vivid left-wing and alternative scene. Consequently, graffiti and politically motivated street art is omnipresent in the streets. They are used as a sign of protest or simply to beautify old or occupied houses. Have a look around Boxhagener Platz in particular as well as Rigaer Strasse. Murals can be found as you comb the side streets around Müllerstr., the main thoroughfare of Wedding between Seestr. and the S-Bahn train station. Wonderful murals can also be found if you walk down Skalitzer Strasse in the heart of Kreuzberg. Start at Kotbusser Tor and walk down the street until you reach Oberbaumbrücke. If you cross the bridge you can continue your street art journey at East Side Gallery. On warm summer days, Berliners like to spend their free time near one of the many lakes in the area. Berliners love their lakes. They tend to freeze over in winter and you may get the chance of ice skating on them. In summer, they turn into free open-air swimming pools, surrounded by nature. Between these two extremes, they are still beautiful places for relaxation and reflection. This list contains the best Berlin lakes that you may want to check out when staying in the city for a little while longer. Wannsee is probably Berlin’s most famous lake. Wedged between Berlin and Potsdam, it’s a popular day trip destination for Berliners who want to take the ferry to the other side. Lots of villas old and new stand on its shores, some of them with historical significance. There is also a public swimming spot with beach (Strandbad Wannsee) which is patrolled and serviced, but you will have to pay an entrance fee of around 5.50 EUR per person. If you rather want to save the money, look out for access points as you follow the shore north. 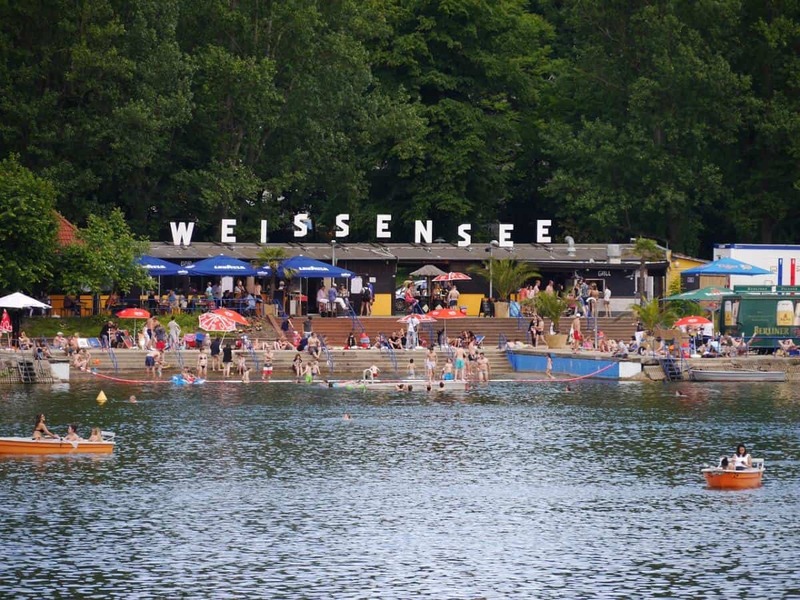 Lake Tegel offers some great swimming spots on its western shores. People also like to come here for boating, biking and sunbathing. It is easy to reach by public transport (U7) but for refreshments it lacks some snack bars and cafes. It summer it does get quite busy. If you are staying in the east, Müggelsee is a great option for a day by the lake. Take the S-Bahn non-stop from Alexanderplatz for an 1-hour ride and then walk another 10 minutes through a forest to get to the lake. Müggelsee is surrounded by forest and small houses and has beautiful clear water. The beach is free. Unfortunately (or fortunately), depending on your view on this) there are restoration works scheduled for 2019. In the north of Berlin, Liepnitzsee near Bernau can be reached after a short walk through the woods. It is said to have some of the bluest and clearest water in the area, and there is a little island in the middle that you can swim to. The serviced area of the lake is only accessible for a fee but there are many “wild” swimming spots along the shores too. Berlin offers something for everybody. You can dine like a royal and sleep like a king, or you can go basic and enjoy the adventure. Trust me when I say that most Berliners live a very ordinary, down-to-earth lifestyle and that they do everything they can to save money in the process. If you follow some of the tips below, you too will keep your budget under control and make this trip to Germany’s capital an affordable reality. Summer is beautiful in Berlin. There are so many things you can do outside that I am sure you will never get bored. In Berlin, chances are that you will want to visit many different things that are not close together. Since distances can be wide, you will need to get around somehow. Luckily, a car is not needed because public transport is efficient and cheap. Look out for tourist passes that will allow you to ride busses, trains, trams and subways. They start at 7.00 EUR for one day, up to 5 days (they get cheaper the longer time they cover). Both, Berlin WelcomeCard and Berlin CityTourCard will also offer you discount for some of Berlin’s best known attractions. You should look out for tickets that cover zones A and B which will allow you rides within Berlin including the suburbs but not outside (Potsdam or Schönefeld Airport, for example). Click here for more info. There are plenty of tour operators in Berlin that offer the popular hop-on-hop-off bus tours around the city. Add to that a plethora of themed tours such as vintage tours, Trabi tours, and bike tours. But the easiest and cheapest way to see the city is by simply taking an ordinary bus that passes many well-known Berlin attractions. Bus 100 starts at Alexanderplatz and ends at Berlin Zoo. Between these stops you come past sights such as Brandenburg Gate, Reichstag, Bellevue Palace, Victory Column and KaDeWe. Alternatively, bus 200 drives by Alexanderplatz, Museum Island, Potsdamer Platz and Kaiser Wilhelm Memorial Church. Since you are already owner of a Public Transport Pass (see above) all of this sightseeing will be free of charge. Potsdam is a great day trip destination from Berlin. While access to Sanssouci and other palaces is at a cost you can still visit the many beautiful parks for free. The city of Potsdam is just outside of Berlin and can be easily reached by public transport. Just buy an extension ticket for zone C on the day that you would like to travel and enjoy the ride! 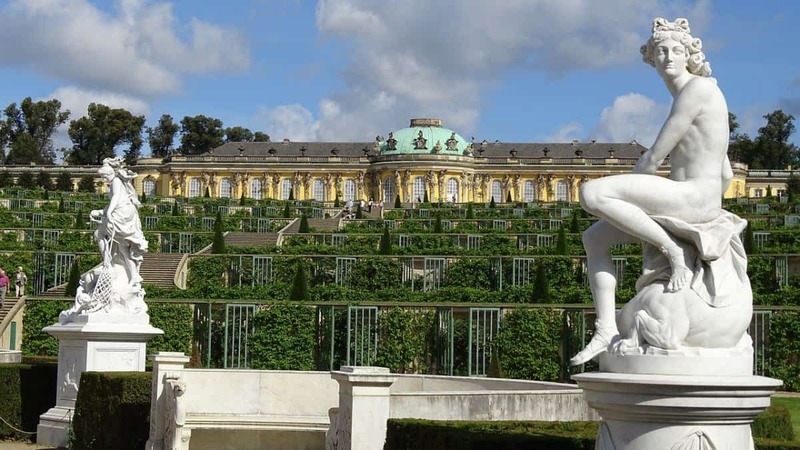 Potsdam offers plenty of free attractions such as the Dutch Quarter, Sanssouci Parc and the beautiful villas of Berliner Vorstadt. With the exception of the historic centre of Berlin around Museum Island and the Government Quarter, you will find plenty of supermarkets around. They offer great value on food and drinks including alcohol. In the front, there is usually a section for business people who are looking to grab a quick lunch: salads, wraps and cold meats. A word about alcohol: Drinking alcohol in public areas is not forbidden in Germany (as long as you behave). So particularly in summer you will see many people in Berlin’s parks and squares enjoy the warm evening breeze with a bottle of beer or wine in hand. It will save you the cost of going to one of the bars in town. Having said that, depending on where you end you partying at night, bars in Berlin can be pretty cheap too. When it comes to cheap eats in Berlin, currywurst is probably the best thing to try. Invented in Berlin (some say), you will even find a museum dedicated to the quick sausage dish in the city (Click here to read more about the Currywurst Museum). Buy it at any street vendor: For around 3.50 EUR you get a full meal consisting of a cut bratwurst with ketchup and curry powder, french fries and optionally ketchup and/or mayonnaise. Definitely not the healthiest option, but definitely cheap and delicious! Staying with a group of friends and the weather is warm and beautiful? Get yourself one of these one-way aluminium BBQ sets and head for the nearest public park. Lighting a fire is not allowed everywhere but you can have a BBQ in some selected green spaces, for example Monbijou Park, Volkspark Friedrichshain and Mauerpark. Please ensure you stay within the designated areas and clean up after yourself. Berlin is a great destination for any budget – there are hundreds of free things to do in Berlin. Every day, new attractions pop up and free events are being scheduled. Look out for street parties such as the Carnival of Cultures (June), Christopher Street Day (July), International Beer Festival (August), and New Year’s Eve at Brandenburg Gate (December) to spice up your stay in the German capital! I hope you liked this article. If so, don’t forget to sign up to the newsletter below for more fresh ideas in Berlin and all around the world! Found a mistake or outdated information? Send me a message!